Spencer Platt/GettyPassengers board an Uber SUV in New York. Most of her miles were logged in Uber rides – yet key differences with its biggest competitor, Lyft, often came up. Tipping was the clear focal point for drivers, who also said the company treats them better, and Uber’s public stumbles under Travis Kalanick could contribute to this. On the surface, there may not appear to be much of a difference between Uber and Lyft. Both companies will get you from point-A to point-B via a car summoned with an app, skimming revenue off the total fare, and eventually paying the driver. But there are more subtle differences only an ethnographer might notice, and even then, only after riding more than 5,000 miles with ride-hailing drivers across the United States. That’s exactly what Alex Rosenblat, a researcher at the Data & Society Research Institute, did for her new book “Uberland: How algorithms are rewriting the rules of work,” which was published October 23. 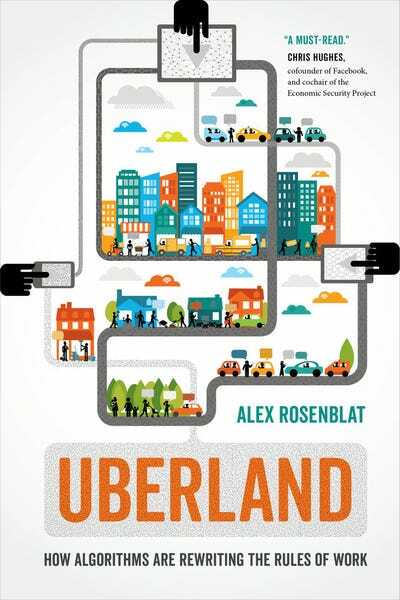 University of California PressUberland, published October 23, explores a dark side to the so-called gig economy. Most of the subtle differences, the ones only a seasoned driver or rider might take account of, all come down to how the respective companies treat their drivers. Despite a number of pushes to classify drivers as employees – and thus entitle them to things like a minimum wage, insurance, and benefits – both Lyft and Uber still consider them independent contractors. She points to the addition of tipping as a perfect example of this treatment. Uber only added the service in July 2017, compared with Lyft which gave riders the option from day one. Then there are the passengers themselves. “The fact that Lyft gets so much less flak than Uber does from the popular press, consumers and other stakeholders, despite the fact that both companies have similar employment practice, suggests to me that the popular divide over these two companies emerges not from their employment practices but from Uber’s highly visible conflicts,” Rosenblat said.